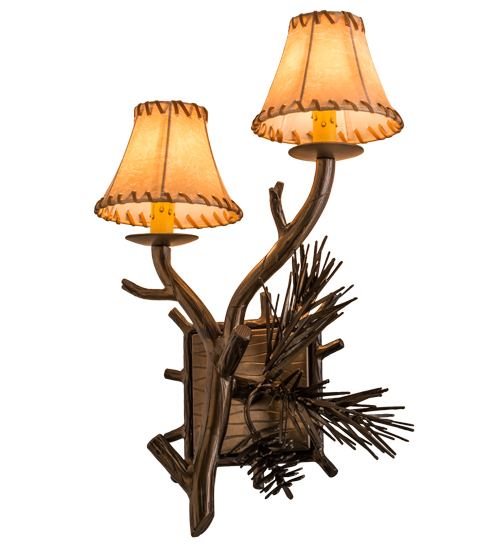 Description: This nature inspired lighting fixture highlights stunning Hand Sculpted Pine Needles and Pinecones, which accent faux candlelights topped with Tan Faux Rawhide shades perched on branch-like solid steel arms. All accents and hardware are featured in an Antique Copper finish. This left-hand fixture is paired with a matching right-hand mate (161370). The wall sconce is handcrafted by Meyda artisans in the USA, at the foothills of the Adirondack Mountains. Custom sizes, styles and colors are available, as well as dimmable energy efficient lamping options.